While Climate change steadily takes its toll, promising to raise temperatures around the world by at least 1.5 °C within the next 100 years, organisms have already started defending their species’ existence in their own ways. Possibly, such is the case of plant lice, which evoked the curiosity of PhD student Jens Joschinski with their reproductive strategy, which shifts from sexual to asexual as the days grow shorter in the autumn. Entomologist Jens Joschinski, currently studying at the University of Würzburg, Germany, is interested in finding out to what extent this advanced reproductive strategy is affected by variable and unpredictable conditions. Do plant lice spread their risks to reduce their losses (like investors that buy hedge funds), or do they put all their eggs in one basket? 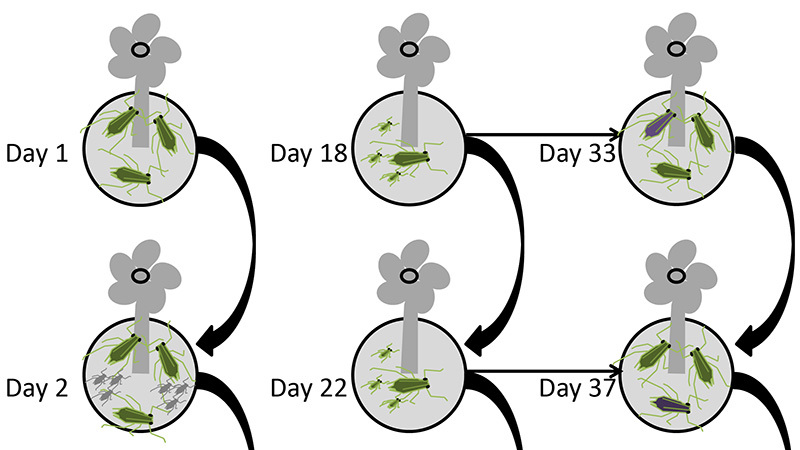 If plant lice manage their risks, does this adaptation compromise fitness? By formally publishing his research idea as a PostDoc Project Plant in the open access journal Research Ideas and Outcomes, he hopes to find fellow scientists to collaborate with, as well as a host institutions. Plant lice reproduce asexually during summer, which means that the mother give live birth to offspring by cloning herself. Then, as the days become shorter, indicating the approaching winter, the plant lice begin to produce eggs, since only they tolerate low temperature and can overwinter. However, there is a transitional period when a fraction of the same species still produce asexual offspring, which is what made Jens Joschinski wonder if this is an intended evolutionary response to climate change. In order to assess the link between variable climates and the transition to sexual offspring, the PhD student plans to study at least 12 plant lice clones from different environments across Europe, and induce reproductive switches under controlled laboratory conditions. Afterwards, he is to assess the fitness and the ‘cost’ of this microevolution phenomenon. The PostDoc Project Plan is to build on Jens Joschinski’s research done as part of his doctoral thesis, which is to be submitted for publication later this year. Then, while also being trained in evolutionary biology, he concluded that the plant lice are active during the day, which explains why they suffer fitness constraints related to the shorter days. Funding was provided by the German Research Foundation (DFG), collaborative research center SFB 1047 “Insect timing“.